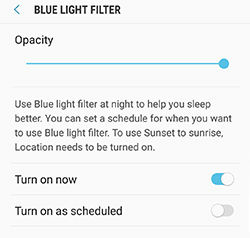 Galaxy S8+: How do I use the blue light filter on my Samsung Galaxy S8+ (SM-G955W)? 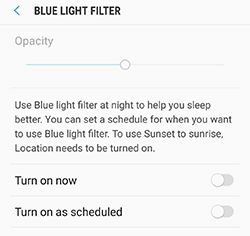 Use the Blue light filter at night to help you sleep better. You can set a schedule to automatically turn this feature on and off. 4. Touch Blue light filter. • Turn on now: touch to enable this feature. • Turn on as scheduled: touch to set a schedule for when Blue light filter should be enabled. You can choose Sunset to sunrise or Custom schedule. 6. Touch and drag the slider to the left or to the right to set the opacity of the filter. Galaxy S8+: How do I set the date and time on my Samsung Galaxy S8+ (SM-G955W)? Galaxy S8|S8+: I tap the soft key of back button but it works as “Recent” button.